As a little tofu, who escaped from plate, you must keep running. Don't stop, but be careful, there are too many sharps can hurt soft you. 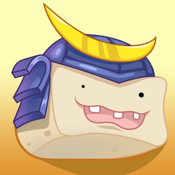 * A new tofu which made by Cheese joined our game, can you make him alive? Explore our little game's deep challenge and grow your mind beyond imagination. Optimized for iOS8, universal app for iPhone and iPad. A endless game which can be completed by genius.